Mosa has plenty of career opportunities for people with ambition and a hearty dose of determination. Mosa is a trendsetter in the international tile industry and is looking for people of every level of training in a variety of fields, from production to sales and administration. Discover more about Mosa and the different career opportunities. Mosa is a highly successful company. 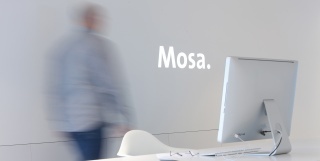 Mosa’s corporate culture is characterised by short lines of communication, a casual work environment, and a hands-on mentality. Its employees form the bedrock of its success. That’s why Mosa employees get plenty of opportunities to advance their own skills and talents by participating in training courses, so they can make a substantial contribution to their own development and the further development of our organisation. If you are willing to invest in our future and your own, Mosa is the company for you. Who wouldn’t want to be part of a successful company with a promising future? Royal Mosa BV is an innovative and international company, with branches and staff located all over the world. Our company currently employs over 600 people, around two thirds of whom work in production-related departments and around one third in other departments. Operations in our production departments are carried out in a sophisticated and high-tech environment in two, three, and five-team shifts. Mosa has been named the best training company in the Dutch process industry and has been certified as a First-Class Employer. The First-Class Employer certification is issued annually to organisations that distinguish themselves as good employers. Royal Mosa aims to be a very attractive employer. Besides a market-oriented salary, we provide our employees with all the necessary requirements that are needed to do a great job. This means for the export countries, that employees often get a lease car, a smartphone, a laptop and a printer. We also provide our employees with some great other (secondary) working conditions.